With its excellent balance of high-speed, range, and maneuverability, the P-51D Mustang was considered by many to be the best piston-engined fighter of WWII. 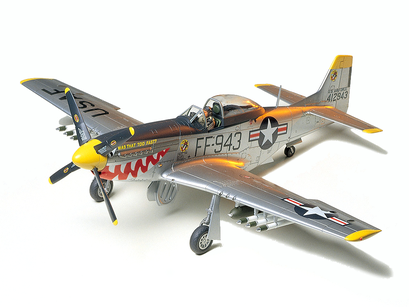 After the war, the U.S. Air Force became an independent entity and the P-51D's designation likewise changed to F-51D. The aircraft was still in service when the Korean War broke out and this kit depicts aircraft which saw action during this conflict. The form of the Mustang has of course been accurate reproduced and a wide range of ordnance, including two 500lb bombs, six HVAR rockets, and two 75-gallon drop tanks used as napalm canisters, has been added for extra value. One pilot figure and three marking options are also included.